Home Learn About Cheese Cheese Musings & Tips Grass fed cheese, meat and dairy – What is it and who does it? Take a glance at many supermarket cheese or milk labels and you’ll often see a picture of a happy cow in a field. The reality is very different, however, because as many as one-in-five cows never actually get to go outdoors at all, and many more are kept indoors for long periods, being fed on cereals, maize, soya and supplements. Aren’t all cows fed on pasture? No, as mentioned, 20% never even make it to pasture. And of the other 80%, the majority will be fed on pasture for some time, but the amount of time pales into insignificance compared with the time they spend indoors. The reason for so many cows being kept indoors is simple – it is more economic, and it’s easier when carrying out intensive farming. The producer can buy cheap bulk feed and feed their animals on silage with maize, soya, cereals and other bought-in supplements. They can control the temperature so their animals burn less calories keeping warm, and minimise exercise and movement so to maximise the energy their animals put into milk production. They can also breed larger animals that produce lots of milk, but may struggle with outdoor terrain and grass. Keeping cows indoors is essential at some stages, however, such as when they are young, weak and infirm, or in the winter. 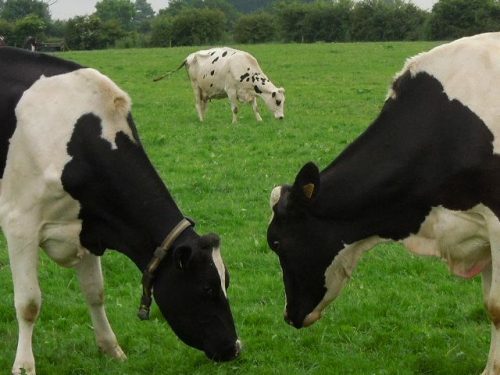 In the UK it is very difficult to feed a cow purely on outdoor grass: grass grows too slowly in winter months, and terrain can become very wet and muddy. Even in the ‘olden days’ farmers would have winter-housed their animal, feeding them on hay. Some animals bred for meat/beef can be fed outdoors at pasture all year round, particularly if they are from the old-fashioned traditional breeds such as Dexter, Longhorn, Ayrshire, Highland and Belted Galloway. These breeds have not been bred with a need to be fed intensively or to consume large quantities in order to fatten up fast. Hence they are slow-growing meat animals and can live on minimal grass in the winter. These beef cattle will not bulk out or grow much in the winter because they will be eating less. But even with these traditional breeds, the UK farmer needs a fair bit of land in order for the cattle to be outside all the time and not have to be fed on hay or silage to top up on cold days. The North Yorkshire producers around The Courtyard Dairy that farm these breeds of cow have lots of moorland pasture, but still the animals need a bit of hay, but not much. So these traditional breeds of cows are first-choice if a farmer is looking for mainly grass-fed animals that don’t need supplements in order to give them the food they need. However they will almost definitely be fed some sort of hay/silage in the winter, unless they are something like Highland Cattle and only then providing the cattle had lots of really good quality pasture and they were good, young foraging stock devoid of animals that are old, thin or immature (the latter do need the additional food to help them through). A dairy cow, however, needs more food in the winter than these beef cattle, because it is being milked. To produce the milk, winter grass would not give enough nutrients, and often even hay or silage won’t provide enough to sustain milk production. This is why traditionally milk and cheese were only made when the cows were out at pasture in the spring/summer and early autumn, when there was rich grass to feed on! Does feeding the animals on grass really make a difference? They say in Switzerland that a cow can’t make good milk unless it is fed on a minimum of eleven different types of grass. And there is no doubt that animals grazing on quality pasture produce a more interesting milk that is unique to the farm; that is why the high-Alpine French and Swiss cheeses made on unadulterated pasture are some are some of the best in the world. Indeed many of these cheeses are regulated to ensure that when the cheese is being made in the summer the animals are only fed on pasture. Quality milk is not just simply a question of recording the percentage of fat and protein in the milk, or the breakdown proportions or make-up of nutrients in the milk. It is much more complex than that, as the specific nature of each of the nutrients, proteins and fats will make a real difference to the flavour. For a farmer feeding an animal on feed produced on their own farm also helps them to make a product that is unique to where it is made. The makeup of the feed, and therefore the milk, is exclusive to that farm. And that is why even when animals are fed additional ‘buffer feed’ or fed indoors in the winter on the likes of hay, silage, oats, peas, etc., The Courtyard Dairy prefers it when the feed has all been grown on that one farm, or at least locally. That way the milk, and therefore the cheese, becomes a true expression of that place. ‘Terroir’, the French call it. As an example of how feed can affect the final cheese, the Stichelton makers found that their cheese was suffering from ‘browning’ and was not breaking down effectively in certain areas. After a year of tweaking and analysing each individual factor, they eventual concluded that the problem was a new feed they were giving the cattle: a vegetable fat given to help the animal produce richer milk. This vegetable fat wasn’t being properly digested by the cow and was coming through into the milk, which, unlike the normal fats in milk, then didn’t break down quite the same way in the finished cheese. The Stichelton makers changed the feed and the cheese got back on track. Is grass-feeding better for the environment and cows? On an ethical level, cows allowed to roam and graze outdoors naturally are exhibiting more of their natural behaviours and are often happier and more relaxed than those kept indoors in pens. There is some evidence that grass-fed milk and beef has health benefits too (enhancing the level of omega 3 fats and antioxidants, and lowering cholesterol). On an environmental level, animals kept indoors consume more fossil fuels (needed to grow and transport cereal feeds), and have a negative impact on the land used to grow commodity crops like soya and maize which need (in the UK) to be farmed intensively with much use of fertilisers and pesticides. When these factors are taken into account, as well as the carbon captured and stored by the grass pasture, grazed pasture and grass-feeding has a more positive environmental impact than intensive and indoor cattle rearing. So how can you ensure that the cheese you are eating comes from a cow fed outdoors on grass for the maximum amount of time? Firstly, find out where your product comes from and research the identity of the producers! It is something The Courtyard Dairy is keen to support and encourage, so the cheesemongers visit the farms to discuss with the producers their farming techniques. It is a matter of pride that The Courtyard Dairy cheesemongers know all of their products inside and out. If you are using a good butcher or cheesemonger, or buying direct from the farm, you can to ask about the provenance. Small-scale sustainable family farmers are keen to champion their style of farming, where animals use and reflect the land, so look out for those producers. So what does it mean when it says on the label ‘grass-fed’ or ‘at pasture’? The legal requirement for calling something ‘grass fed’, for cheese, milk and beef production, is that the animals are fed on grass for more than half their lifetime (51%). The rest of the feed could be supplements (maize, barley-feeds, soya, cow cake, etc.). On the other hand, the words ‘at pasture’ aren’t regulated at all! 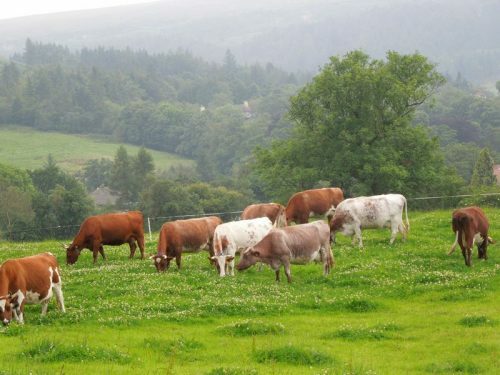 (If the producer subscribes to the ‘Pasture for Life Scheme’, however, (for example meat producers like Eversfield) the animals must actually be fed 100% on grass. Another good scheme to keep an eye out for is Demeter farms – they are like organic, but insist the cattle are kept outdoors for a proportion of their life and a certain amount of feed has to be made on the farm, not bought-in. Within the grass-fed category, the term ‘grass-fed’ actually includes all forms of grass – grass out at pasture, grass stored in the form of silage (cut, fermented grass) and hay (cut, dried grass), so it is important not to think ‘grass-fed’ means that the animal is always outside eating fresh grass. Most of The Courtyard Dairy’s cheese-makers will feed their animals on the other forms of grass when they house their animals for the winter. Which is why The Courtyard Dairy’s cheesemongers will never tell you that their cheeses are all 100% grass-fed cheese: Andy Swinscoe doesn’t count silage and hay as grass, as they are not the same as pasture. It is easy to get confused! What about the term ‘Free Range Dairy’? Unlike with eggs, the words ‘free range’ applied to milk guarantees nothing! When applied to milk and dairy, ‘free range’ has no legal standing. 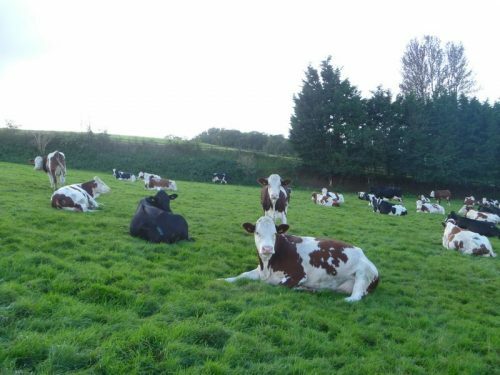 One group of farmers, however, has combined to form the ‘Pasture-Promise’ label, which guarantees that their animals have been kept out at pasture (including night time) for a minimum of 180 days a year. It is worth pointing out that some farmers the UK would even struggle to get this accreditation if they wanted to; simply because of their local climate and terrain. A cold, wet Welsh hillside, for example, is unlikely to provide even six months of good pasture! As you’ve probably realised – farming is complicated, and not simply black and white, despite the marketeers’ labels and descriptions leading the public to believe it is. So are these various schemes worth buying in to? Yes. They do guarantee a base level of quality and that the farmer concerned is caring – particularly the Pasture Promise, Demeter and Pasture for Life Schemes. But it is worth noting that, as with all labels and accreditation, there are many farms that carry out best practice in farming and animal husbandry but do not necessarily subscribe to the schemes, or qualify exactly because of their unique conditions. That’s why it is best to get to know where your product comes from by asking your retailer and farmer. Then you can be sure. So which cheeses are produced from cattle fed in the majority at pasture? All of the cheeses supplied by The Courtyard Dairy come from animals that feed out at pasture for the maximum time available to that particular farm – which depends on the individual location (upland v. lowland, ground conditions, temperatures, rainfall, etc. ), but some of those go further to really highlight their ‘terroir’ – feeding their animals sustainably and maximising the use of feed they grow on their farm. Here’s a few to look out for: Hafod Cheddar, Summer Field (only made from summer-pasture-fed animals), Barwheys, St James, and Hebden Goat. They may not be 100% grass-fed cheese by our book, but they’re as close as you’ll get! This five-minute video tells the story of Hafod cheese, from the very beginning of the Sam and Rachel Holden’s journey into cheese making to how the cheese is made now. I want to become a cheese maker… where do I start?